When we praise God in the storms of our life it brings victories only God can create. As soon as they started shouting and praising, God set ambushes against the men that were attacking Judah, and they all ended up dead! In this first part of this chapter the Lord spoke through the prophet what he was going to do and what he wanted the people of Judah to do. They were to go to the battle and watch what the Lord was going to do. They were to march boldly, and praise and worship during the battle. Giving the battles in your life to God is hard. Praising and worshiping is hard too. When you want to just cry and you have lost something important it’s hard to give the battle to God and then praise and worship Him. I had something happen in our family that there was nothing my husband and I could do but give it to the Lord. We did and we started praising and worshiping God, yes, it was the hardest thing we ever did, but the Lord showed up and gave us such a peace that could only have come from the Lord. Then every time we felt like things were not going well we would turn on praise and worship music and dance and praise God. 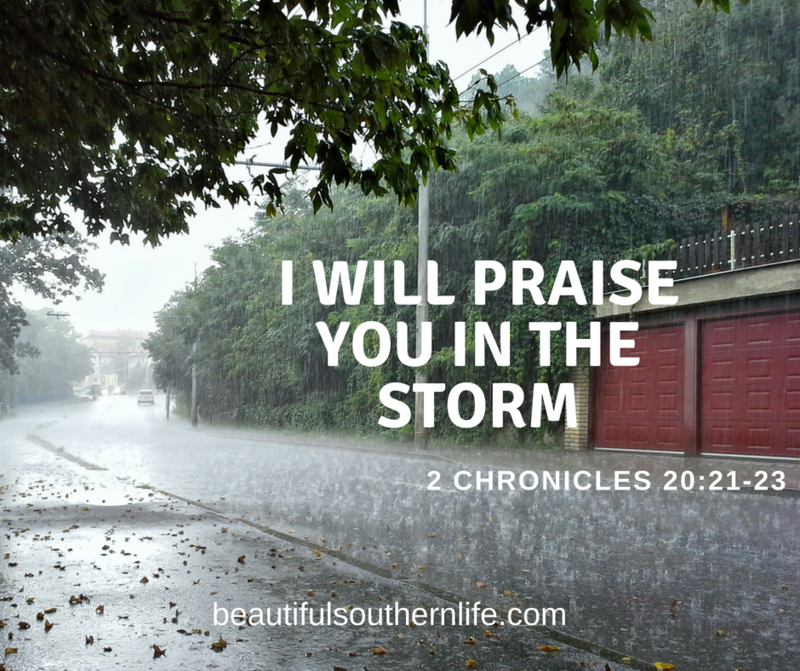 God did mightily turn the situation around and in such a way that we knew God had fought our battle and all we had to do was declare his promises and praise him during the storm. Dear Lord help me to learn to give my battles to you. Help me to praise you even thou I’m in a stormy time in my life right now. Give me your peace during the storm and work every thing out in a way that’s best for me. Teach me how to praise you in the storm. Give me your strength to get through right now! I praise you Lord! I praise you Lord, I give you all my praise. I worship you Lord! I give you praise! Amen.